Over the winter, I've wandered Northmavine with my camera set to Doom-Laden-Black-and-White-Artiness, snapping pictures of this, that and the other. But mostly the sky. 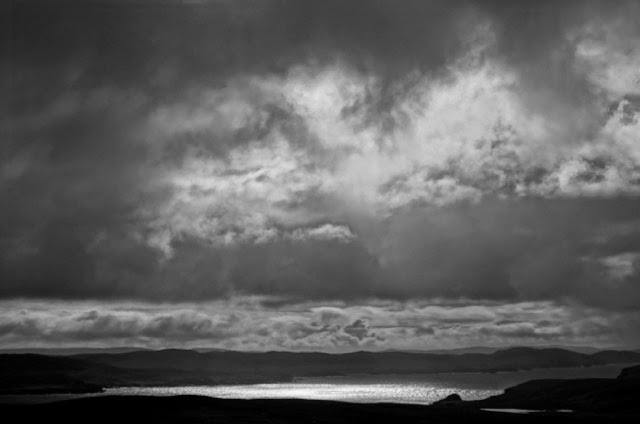 Sometimes it seems that Shetland is all sky. The low humps of the landscape, the lack of trees, the scattered humans and their occasional, crouching habitations...add some of the most extreme weather in Europe and you can find yourself unconsciously bent and cowering beneath the firmament. I've known visitors who left swearing never to return, intimidated by what they saw as the massive, glowering threat above them, the sense of their own insignificance. 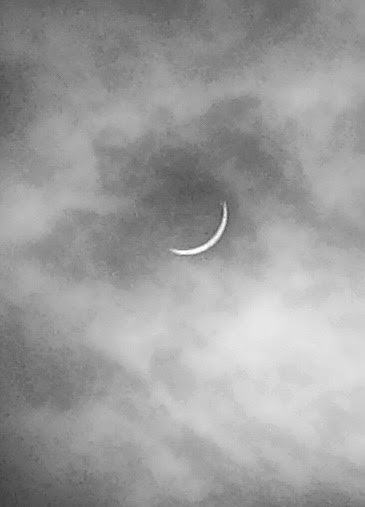 But our skies move and change, season by season, moment by moment. From the Northern Lights' strange flickering towers of night-time colour to the boiling, scudding clouds of day, the sharp beams of stark sunshine, highlighting the glint or thrashing power of the sea. I love it, winter and summer, viciously cold and blisteringly, briefly hot. 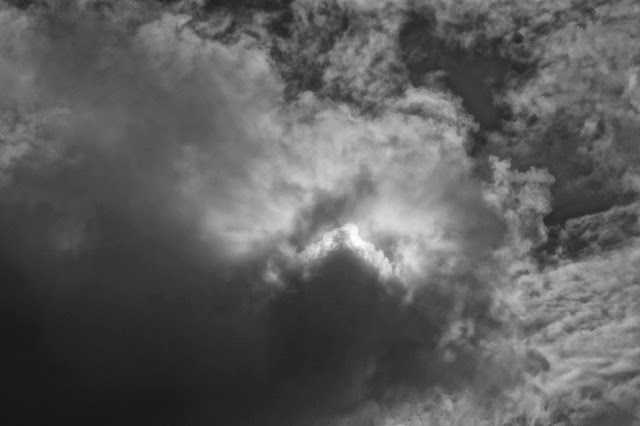 Anyway, today was to be the solar eclipse, and Shetland was promised 98 per cent of the sun obscured. Not that an obscured sun is that unusual hereabouts. Still, the moon had to do what the moon had to do, and so I prepared a flask of coffee and climbed the Clave, the highest point of the Hillswick Ness. I changed the camera's setting to Rock-Star-Rayban-Facing-Flashgun mode and waited. Proper coffee, Vietnamese full roast from The Longship in Orkney. It was cold and gusty, but the sky...the sky was in full, playful try-and-keep-up mood. 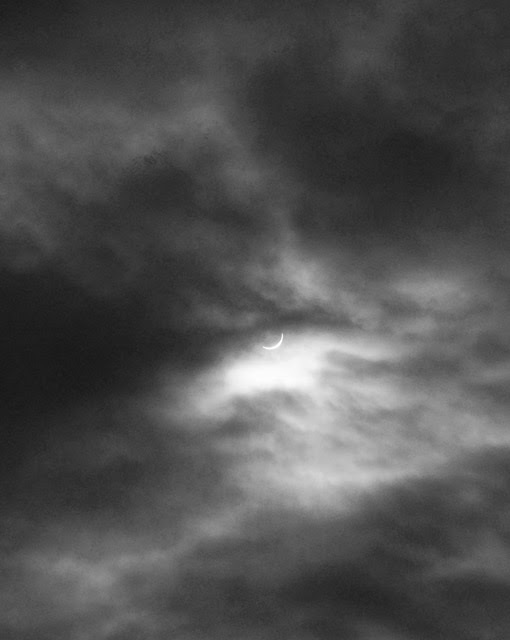 I sat on the overgrown concrete base of an old wartime radio mast, drank Java and marvelled as the sun blinked, the eclipse showed itself coyly among the clouds, and Northmavine, Shetland and its ever-altering skies remained as miraculously beautiful as ever. A very special welcome to those here who are visiting the isles. Those whose money and resources we wish to appropriate. Shetland has its own beer, its own gin, will soon at last have its own whisky, and as you will have noticed, has some of the best weather in the northern hemisphere. You’ll have seen the forests of palm trees swaying gently in the wind. It’s also a place of invention. Smallpox inoculation began here, courtesy of the man known as Johnnie Notions. Erving Goffman invented modern micro sociology after a summer spent working on the island of Yell. And of course, the internet was invented in Scalloway. Or to be precise, a peerie bit of it was. It is alleged that 'power circuit networking' was invented by an engineer in Scalloway - that’s the business of using home electrical circuits to send your broadband from room to room. I’ve been told that this was an accidental discovery made when one BT engineer wired a telephone into the mains by mistake. But when I put this to BT management they said it was, and I quote, a shocking allegation. I'll never overrev you in third gear! During the referendum campaign, which you may (or may not) remember, a journalist came to see me. Indeed, I used to work for him, when I too was a journalist, before I became a light entertainer. He had come to Shetland as part of a 'state of the nation' tour of Scotland, and I was happy to make him some lunch, introduce him to my two St Bernards, give him a cloth to wipe the drool off his expensive Edinburgh breeks. He wrote a fairly innocuous piece at the time, and it wasn’t until a few weeks ago, in a column, that he revealed how he much he hated Shetland, hated we who live here, hadn’t enjoyed his lunch and was forced to throw away his trousers due to the acidic qualities of St Bernard slobber. But there was another reason, I felt, why he didn’t like Shetland. He got a knockback, apparently, in Posers. Or rather, from Posers. Posers is a nightclub. Posers is THE Shetland nightclub. And what a name that is! Worthy of Ibiza. Or Orkney. When I first came to the isles, almost 30 years ago, I was used to Glasgow nightclubs and when I was told by my wife to be we were going to one in Shetland I dressed accordingly - Levi 501s, polished Docs, Cruise leather jacket. So we got to the door, and the bouncer said - sorry sir, you can’t come in wearing that. Or those. I was forced to remove my jacket and my shoes, and put on a pair of strange funeral Grand Hotel brogues. I walked in and the first thing I saw was two guys at the bar, wearing boiler suits and wellington boots. It's a Boston two step! Wool on bare skin can be? Just one final verse, and this one concerns my own assimilation into the ways of Shetland fashion. The padded lumberjack shirt. The Dickies jeans. The unavailable-anywhere-else Wolsey Bri-nylon underwear. Guaranteed to provide enough static electricity to power the average pacemaker.